The following table shows a summary of GCAL emission line plots for two lamps (Ar and Xe) at near IR wavelengths. The spectra all have the same integration time. Wavelengths are in vacuum. See also the general wavelength calibration page for more line lists etc. In general, the Argon lamp will be sufficient for wavelength calibration in most GNIRS observing modes. However, for the long camera / 111 grating case (R=18,000 mode), you may need to take supplementary Xenon lamp observations at wavelengths where the Argon lines are sparse. Check the plots below to verify this. Note: The wavelength range in each of the plots below is equivalent to the coverage delivered by the short camera / 111 grating mode (R=6000), and 3 times the spectral window of the long/111 mode. The Argon lamp is sufficient for all arc lamp calibrations when using the 32 l/mm grating. 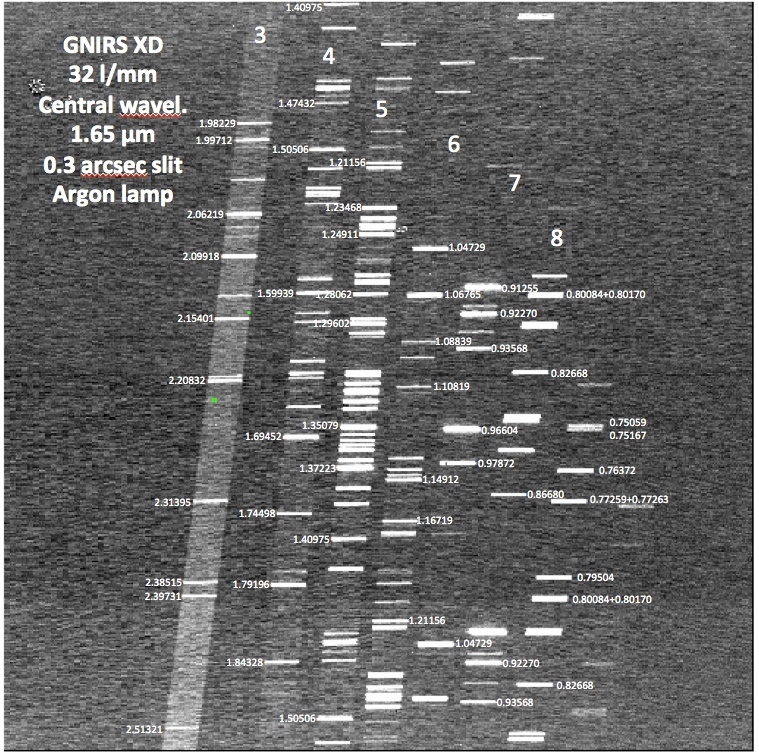 The following image and plots contain spectra of the argon lamp and line identifications: first a spectral image with some line IDs for the complete cross-dispersed 32l/mm grating + short camera mode, and then separate plots for orders 3 through 8 of that mode .